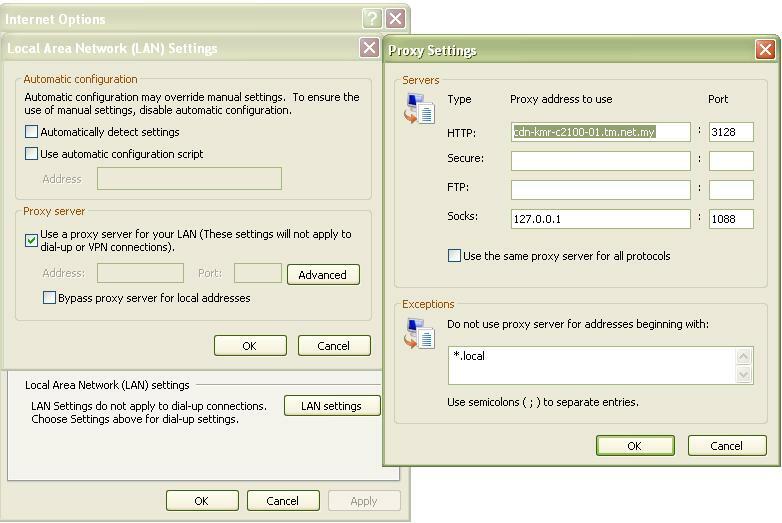 IP address is divided into 2 purposes; one is for external (normal use) and internal (private network, localhost). The internal IP is only usable within the Local Area Network (LAN). It will not pass through the modem/router and people from outside the network normally won’t be able to connect/enter to your device through the usage of private IP. But by using Virtual Private Network (VPN), you are able to connect in between different private networks. Guys, if you having packet loss problem now with streamyx, you can use these proxies. Notes: If you happen to get error message while surfing the net using this proxy, which means this proxy is no longer usable. The most full-featured Internet power tool on the market, Opera includes pop-up blocking, tabbed browsing, integrated searches, and advanced functions like Opera’s groundbreaking E-mail program, RSS Newsfeeds and IRC chat. And because we know that our users have different needs, you can customize the look and content of your Opera browser with a few clicks of the mouse. Google is the big brother of all search engines. If something is uploaded into the Internet, sooner or later it will be crawled and indexed by the Google bot. This is inevitable unless there are preventive measures taken to ensure the content is not accessible to the Google bot. Although sharing some types of MP3 files is considered illegal, there are still people who have uploaded them. We can always use Google to search for these MP3 files, provided you know the complex codes that are required. I stumbled upon two websites that enables us to easily search for MP3 files on the Internet. There are four steps that you need to follow in this instruction. Just follow them and you should be fine. This is an easier alternative. You can search for other items apart from songs using this website.